. Persimmon legends and art motives . There are said to be more than 1000 different kinds of KAKI in Japan. 渋柿と甘柿 shibugaki and amagaki, bitter and sweet kaki. Die Sharonfrucht, die nach der Sharon-Ebene in Israel benannt ist, wird oft durch Chemikalien zur Reifung gebracht. The most important sweet one is Fuyuugaki (fuyugaki) 富有柿 and Jiroo 次郎. They become black and hard when dried. They can be kept 3 months in the refrigerator. They are mixed in salads or cut finely and mixed with pickles or in yoghurt. In Wakayama, they grow a type without kernels. from Ichita, South Shinshuu, Nagano. They are eaten for the New Year and other celebrations. "The more kernels there are in a persimmon eaten on the first of January, the richer you will become during this year". One last kaki (or a few) is left on the tree to "watch over it"
These fruit are eaten by the birds and badgers and other animals. momo kuri sannen, kaki hachinen 桃栗３年柿８年..
but it takes eight years to harvest from a persimmon tree. the doctor becomes pale (runs out of business). Because of its vitamins and minerals it is very healthy. prepared in the town of Shigo, Katsuragi, in Wakayama. They are used as a decoration for the New Year, placed on the mochi, usually in the Kansai area. inside a harmonious couple (six on the inside). So they are put on the stick in the order of two ... six ... two. The farmer's wife puts them on skewers from morning to evening, for two months. The son binds them in layers to hang out for drying. They are dried under roofs outside and have to be taken care of when the mountain fog comes up. All are quite exhausted each year when the persimmon harvest is over ... and not even a fruit to eat. It is the job of the farmer to get the persimmons down from the tree. The fomenfolk then do the other preparations. The skin is peeled, they are then dried in the sunshine for a week or longer in special store shelters outside, until they are very dry and show a white powder outside, which is the natural sugar to make them taste sweet. They were a special winter treet for many villagers in the mountains and used also for the new year decorations, like the kushigaki above. aus Takamatsu. a bitter variety, about 300 g heavy. Once Saint Shinran 親鸞聖人 (1173-1262) on his way to exile in Echigo (now Niigata) stayed over night in a farmhouse. He told the eager farmer Tsujihara Saemon 辻源左ェ門 all about his religion, the New Pure Land Buddhism. Outside an old grandmother 経田屋太兵衛の老婆 heared his sermon. 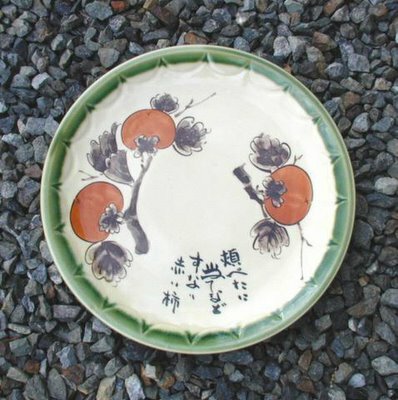 The next morning, when Shinran passed Keitaya 経田屋, she gave him some persimmons on a stick to eat. Shinran was very pleased about this. He took three seeds out of the persimmons, which had been grilled in the hearth and were half-black, and planted them in the garden,saying: "May they bring forth buds and be witness to my beliefs!" 我が末法世に栄えるならば再び芽を生ぜよ (this is a legend, of course). And for sure, over night three young sprouts came out of the earth and grew into three persimmon trees "sanbongaki" 三本柿. The fruit and kernels of these persimmons have black spots (from the hearth fire) to this day. Thus the whole village took the name of "persimmon village" kakigichoo 柿木町. People who tried to cut them down were severely punished. One still exists today, with replants over the years. In 1956, the town build a fence around it. There is now one tree at the tempel Tsujitokuhoo-Ji 辻徳法寺 and its fruit have black spots as if they had been burned down. 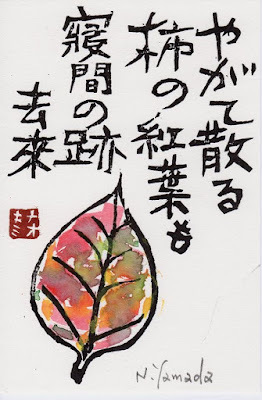 The abbot knows this: "The three trees in front of Keitaya 経田屋 became old and dry over the years, but one of them was planted to the temple and survived there, and the two others are now lost." And a sweet with white beans and dried persimmons sold in Kurobe Town in honor of this legend. There is even a haiku about these trees. Shinran had been in exile for five years in Echigo (now Niigata), but was pardoned in1211. Saint Shinran / More in the WIKIPEDIA ! Shinran (1173-1263) war ein buddhistischer Mönch, bekannt als Begründer der „Neue Sekte vom Reinen Land“. Er studierte zunächst mehr als 20 Jahre lang in Kyoto im Bergkloster auf dem Hiei-Zan, distanzierte sich dann aber von der Lehre des esoterischen Buddhismus und folgte Honen (1133-1212), der die „Sekte vom Reinen Land“ begründet hatte und eine einfache, fromme Anrufung des Buddha Amida propagierte. Nach Streitereien mit den orthodoxen Lehren des Buddhismus wurde Honen und bald auch Shinran in die Verbannung geschickt. Auf seinem Weg in die Verbannung nach Echigo (heute die Präfektur Niigata) ereignete sich die folgende Episode. Shinran übernachtete im Haus des Bauern Tsujihara Sa-emon in einem Dorf in der Nähe der heutigen Stadt Kurobe. Die beiden Herren verstanden sich auf Anhieb und Shinran verbrachte die ganze Nacht damit, dem Bauern seine Lehre zu predigen. Eine alte Nachbarin hörte ebenfalls interessiert zu. Als Shinran am nächsten morgen weiterziehen wollte, kam die Alte und brachte ihm ein paar Persimonen als Wegzehrung. Er verpeiste sie sofort, nahm die drei Kerne, die von der Herdasche schon fast schwarz waren, und pflanzte sie im Vorgarten der alten Frau mit dem Spruch: „Mögen sie sprießen und Frucht bringen, so wie meine neue Lehre!“ Und siehe da, bereits am nächsten Morgen begannen sie zu sprießen und drei stattliche Persimonenbäume wuchsen heran. Die Früchte und die Kerne haben bis heute schwarze Stellen. In der Stadt Kurobe wird heute in Erinnerung an den Aufenthalt des Heiligen Shinran eine Waffel mit süßem weißem Bohnenmus und kleinen Persimonenstücken verkauft, die den stolzen Namen trägt „Die drei Persimonenbäume“ (sanbongaki). Die „Sekte des reinen Landes“ nach den Lehren von Honen und Shinran, mit dem Westlichen und Östlichen Tempel Hongan-Ji in Kyoto als Mittelpunkt, ist inzwischen weltweit verbreitet. Auch in Deutschland gibt es Gruppen, die dieser Lehre folgen. "Hermitage of the fallen persimmon"
is the cottage of Genroku poet Mukai Kyorai 向井去来. Kyorai was one of ten disciples of the haiku poet, Matsuo Basho. The cottage was listed in the Shui Miyako Meisho Zue, an Edo period travel book that listed famous places to see in Kyoto. The name of the place is derived from a story of how Kyorai achieved enlightenment. There's a bit of word play here. Arashiyama is a mountain near Kyoto but it means literally 'Storm Mountain'. Basho visited here three times, in 1689, 1691 and 1694.
. Mukai Kyorai 向井去来 (むかい きょらい) . his sister, who died very young, age 25 only. yagate chiru . . .
is a district on the western outskirts of Kyoto, Japan. It also refers to the mountain across the Ōi River, which forms a backdrop to the district. 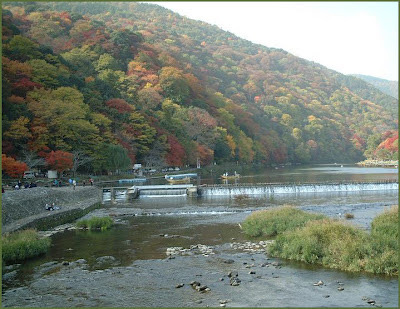 Arashiyama is a nationally-designated Historic Site and Place of Scenic Beauty. 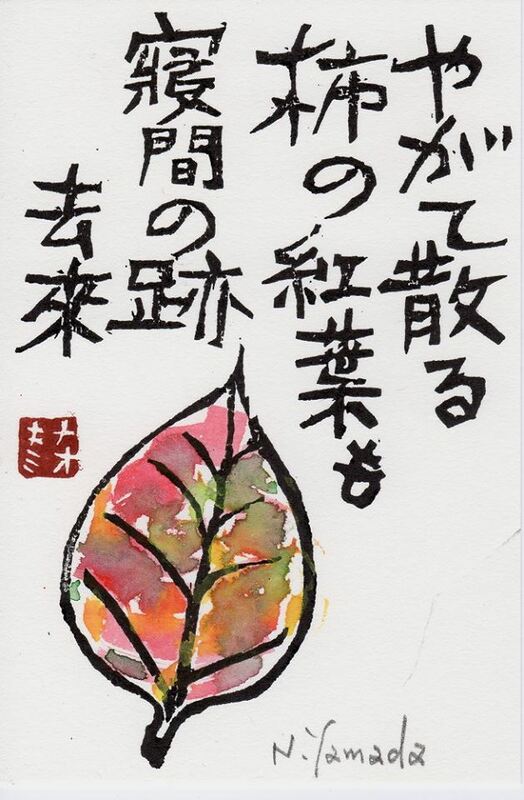 Basho is referring to the sixth lunar month. The most representative food of autumn in Japan. Rich in vitamin C and carotin. They can be cut finely and mixed with meat and curry dishes. The stem is dried and made in to a kind of Chinese medicine, shitii 柿蒂（シテイ), good for cough. The leaves contain Vitamin C, B and K and other minerals. They are also made to a kind of tea-medicine. Their antibacterial properties make them good for wrapping sushi rice. The fresh leaves of spring are made into tempura. 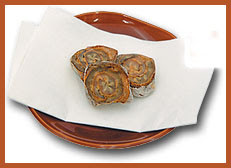 speciality from Nara, Wakayama, Ishikawa prefectures. In Nara, the leaves are pickled with salt and let ferment. It is sold at the airport and train stations. Meat from Salmon, tai and anago is put on the sushi rice. Persimone, Diospyros kaki. Kakipflaume; Sharonfrucht. Or: "his dirty blossom-viewing/ robe.../ he looks like Kyorai." Shinji Ogawa notes that Kyorai, or Kyorai Mukai, is a name of one of Basho's disciples.